The three chill days we spent hiking around Sossusvlei were followed by three of the least relaxing of the trip. 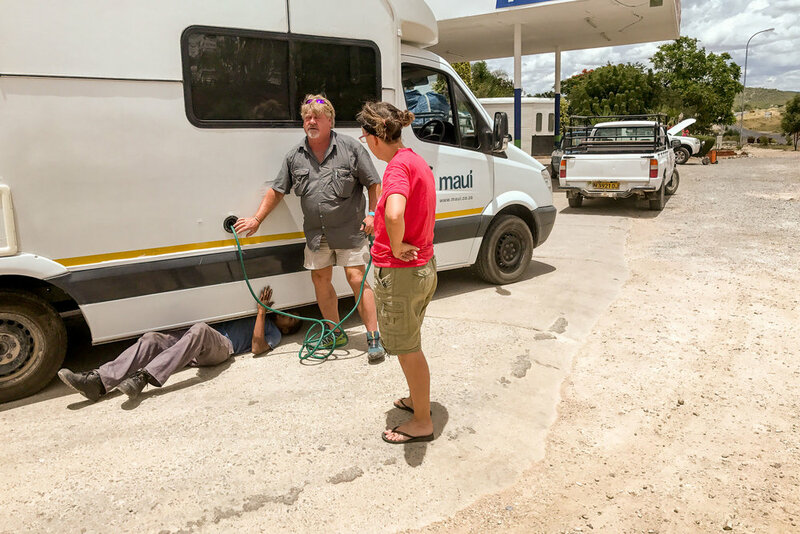 We headed off the next morning toward Windhoek by way of Mariental. We'd only been on the road for an hour when we ran across two Nama ladies and their uncle hiding from the sun in shade of a broken down pickup. They'd been stranded the day before when they'd gotten a flat, only to find that the spare was flat as well. They'd been waiting for 24 hours without food or water. We left the uncle with 8 liters of water, some fruit and cheese, and gave the two women a ride to their father's home about 100 kilometers east in Maltahohe. Donna passed a jug of water to them in the backseat and held out a large bag of rusks (African biscotti) for them to pick a few pieces from. As we drove they spoke to one another in Khoekhoe, a fascinatingly beautiful language full of clicks that’s common throughout Namibia. At one point Donna turned to to me and mouthed, "This is sooo cool..." I couldn't conceivably have agreed more. This is why you travel. As we dropped them off in Maltahohe one of the ladies was talking on her cell phone. She hopped out of the backseat and as she shut the door, holding the phone to her ear with her shoulder, she reached back in and snatched the bag of rusks from the seat. We watched as she walked away, our breakfast swinging gently from her hand as she chatted on the phone. We drove the rest of the way back to Windhoek and the airport where we traded in our 4x4 for an (ill-advised) campervan. We then drove back through Windhoek for the second time that day. It turned out to be about the only time on the entire trip that Donna and I got frustrated with each other. I was getting frazzled because Donna wouldn't tell me until we were actually at an intersection that we needed to be three lanes over from where we were so that we could make a turn. She was getting frazzled because, unbeknownst to me, the maps I had thoughtfully cached on the iPhone didn't have street names or a scale on them! Once we both understood the problem, it didn't take us long to get our act together. By the end of the trip we were to drive across the entire length of Kampala twice, some of the worst traffic in all of Africa, making only a single "wrong" turn (where Google showed a non-existent road). We drove on to Swakopmund that same evening. The road is narrow, dusty, and desolate with semi-trucks flying out of the dark night like neon phantoms. We covered a distance of 965 km that day with the first 150 km on dirt and gravel. It felt at least twice as far. The next morning spent about ten minutes walking along the beach, found a couple of cups of coffee at a grocery store in town, then turned around and drove all the way back through from Swakopmund to Okahandja and then on to Otjiwarongo where we camped for the night. An ill-advised excursion to Swakopmund. 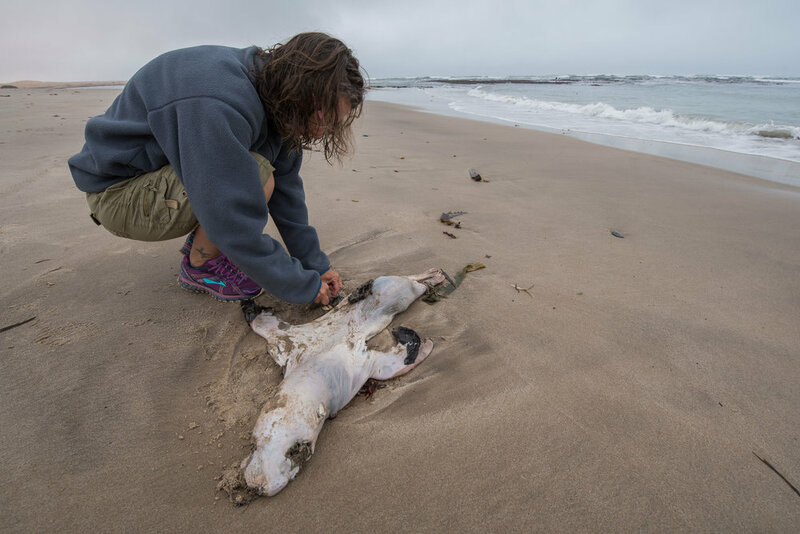 Donna wondered whether this sea lion might have ingested plastic, a not uncommon cause of death in sea birds. A quick check of the stomach and intestines showed none. And, yes, ... her fingers smelled about like you'd expect for a couple of days afterward. This was the highlight of our trip to Swakopmund. 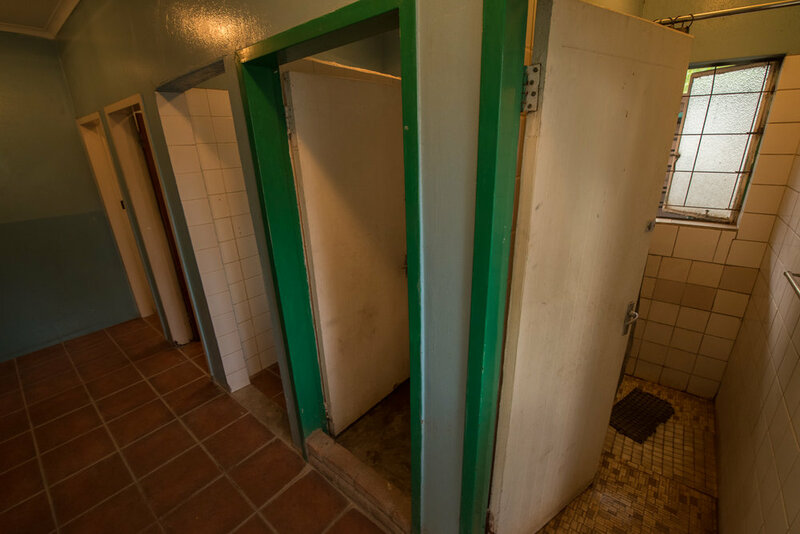 Swakop has the feel of a quaint German town that's been transplanted and left a bit neglected. Admittedly, however, cities are NOT our thing. A small mineral market at the intersection of B2 and D1918 about an hour east of Swakop. We finally camped that evening at a place with, um, ... character. 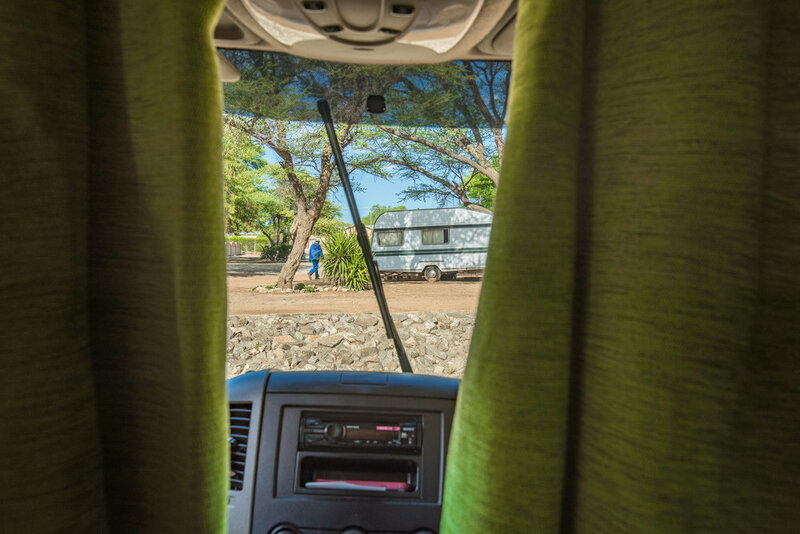 The Acacia Park Campground in Otjiwarongo was good fun, razor-wire fences and all. There was an old-fashioned, Bible-thumping revival blaring late into the rain-spitting night on one side of the parking lot. A dance bar pumped techno out on the other. Not all that conducive to sleep, but an experience we'll remember. Hitting a rain storm just to the south of Otjiwarongo. Razor wire fences. Muddy ground. Moldy bathroom... It had character, though! Actually, to their credit it was quiet clean, just a bit worn. The evening's rains eventually gave way to a pretty sunset. An old-fashioned, traveling revival on the left side of the parking lot; nineties techno thumping from an open-air bar twenty meters away on the right side. All of this barely further from our camper than I could throw a clod of dirt. Not conducive to sleep. We’ll keep the description of the next day short and sweet: we got a flat tire before we'd barely gotten started. We were helped by some very kind folks along the road and some even kinder folks at a small tire shop on the north end of Outjo. Later in the afternoon we had a chance to return the favor to some stranded locals. Then we were rained on, dumped on. We gave a ride to a rain-soaked teenager who we came across walking tens of kilometers from the nearest town or pavement. Then the sun came out and once again we were bounced about till our teeth nearly fell out and covered in a none too thin layer of red dust. We felt a bit better when the sun came up, blue and warm, after the mud-splatter, razor-wire night. About two minutes after this was taken we got our second flat of the trip. Just south of Outjo. We were halfway through putting on the spare when a pickup sped past us, then pulled a quick U-turn. We weren't quite sure what to expect when five guys hopped out. Three minutes later they had the spare on, the flat stowed, and the jack replaced. Done for a set of handshakes all around. Can You Throw a Patch on This For Us? 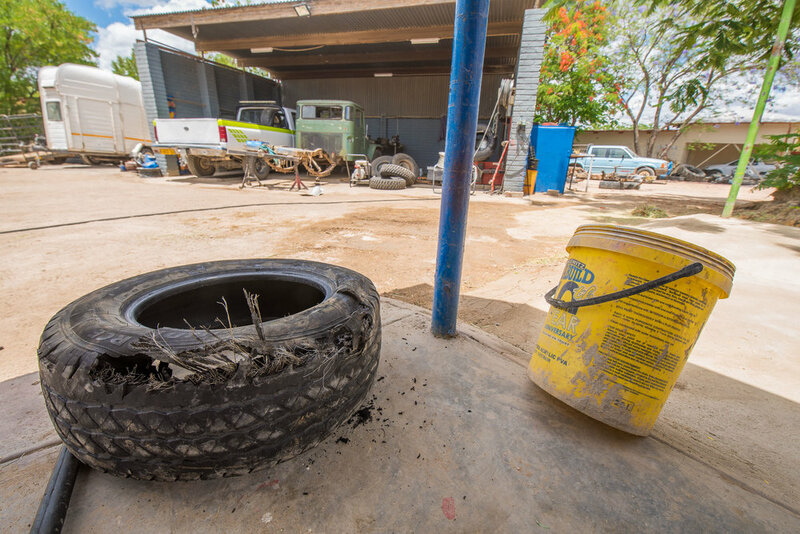 Twenty kms down the road in Outjo, tire shop owner Jan called all over the place to find us the right size replacement. We bought two. Jan's good friend, a local game ranch owner, Ranier, was waiting while his own tires were changed. He helped us to figure out some water issues with the camper, tried to track down a 4x4 that we could borrow for a few days, and offered us a place to stay, complete with a campfire and whiskey. In the end, we couldn't make it work with our schedule, but we were once again left heartened about the world we live in by the kindness of fast friends we met along the way. A few hours later we ran across a family, husband, wife, and three kids, whose car had broken down west of Khorixas. They had a ride coming so we left them with a few liters of water, apples, and cheese. Then it rained. We came upon a teenager walking down the middle of the road in a torrential downpour. We gave him a lift to his family's place a few kilometers down the road. He gave us the biggest smile when he got in, but was starting to creep us out by the time we dropped him off. Suffice it to say, it had been an interesting three days. We were left a bit addled by the washboard roads, whirling night drives, sketchy campgrounds, and mornings deflated by truly terrible instant coffee. Yet we'd been buoyed by the kindness of strangers more than once — one of the great joys of traveling. Finally coming across the turnoff for Camp Kipwe, where we’d reserved a room for the next three nights, left us wanting to pinch ourselves. Dare we let ourselves actually believe it could really be... ? Could it really be? The promised land: Camp Kipwe, Damarland, Namibia.